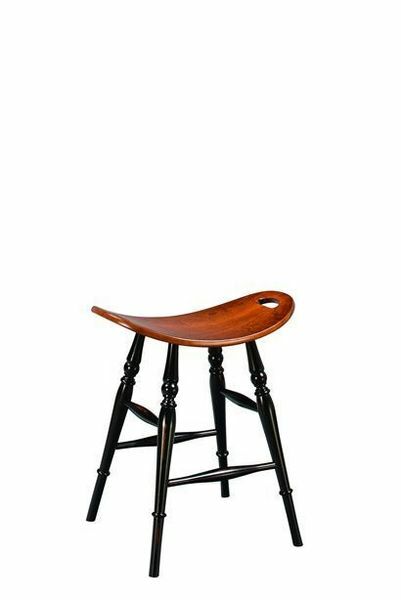 Backless barstools like the Amish Saddle Barstools save space by tucking neatly under the kitchen counter or bar. These solid wood saddle barstools go rustic with turned legs and a perfectly shaped wooden saddle seat. These are ideal stools for a kitchen island, and they dress up casual dining in a strong supportive way. Your barstools are custom made by skilled Amish craftsmen. Each one is hand sanded and refined to provide a smooth and comfortable seat. Order online today or call or email us with any questions. We can be reached by email at Questions@DutchCrafters.com or by phone at 866-272-6773. Height at lowest part of seat: 23"
Height at highest part of seat: 25"
Footprint: 18 1/2" x 18 1/2"
Height at lowest part of seat: 29"
Height at highest part of seat: 31"
Linse, I just wanted to thank you and Mimi so much again for the quick turnaround on the drop leaf table and saddle stools. My wife and I were ecstatic to get them and look forward to many years of good memories with them. I wish you both the best. Please also thank Samuel for the fine work.